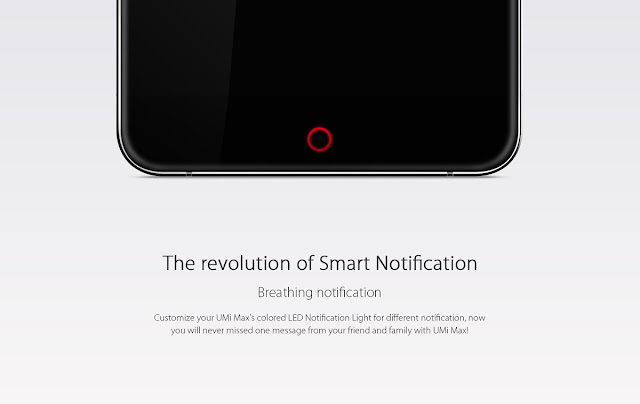 Have you ever heard of smartphone brand "UMI"? I recently heard it since writing this article. I was surprised by the excellent specifications. The manufacturing company did not mess around in making this smartphone. 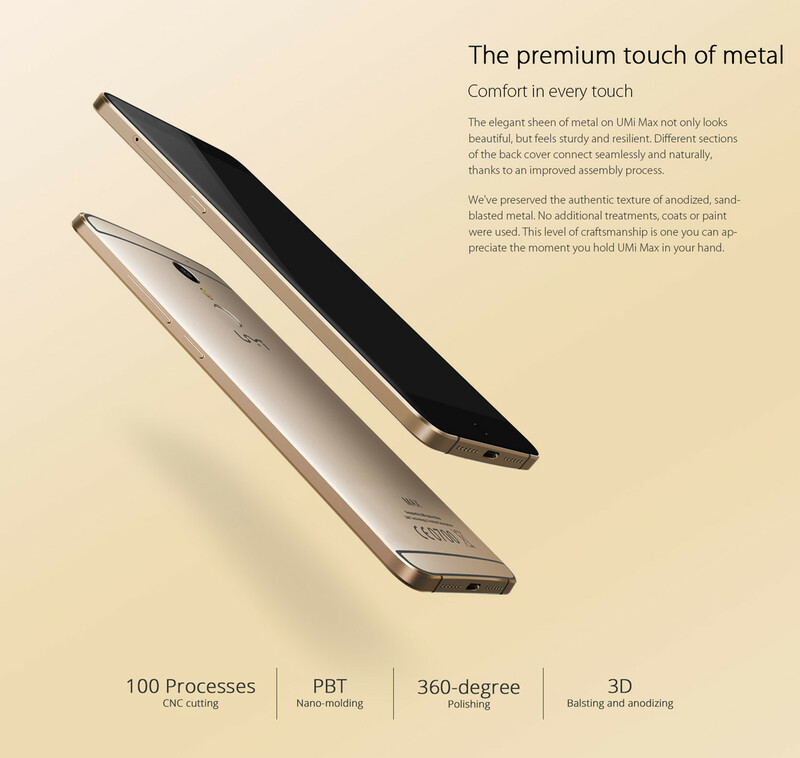 the screen size is 5.5 inches, and coated with corning gorilla glass 3, already supports fingerprint scanner, full body metal with an elegant design, 3 GB of RAM and the kitchen runway Helio P10 Octacore 1.8 GHz. All the parts that make up the smartphone UMI Max 4G Phablet comes from several well-known vendors. 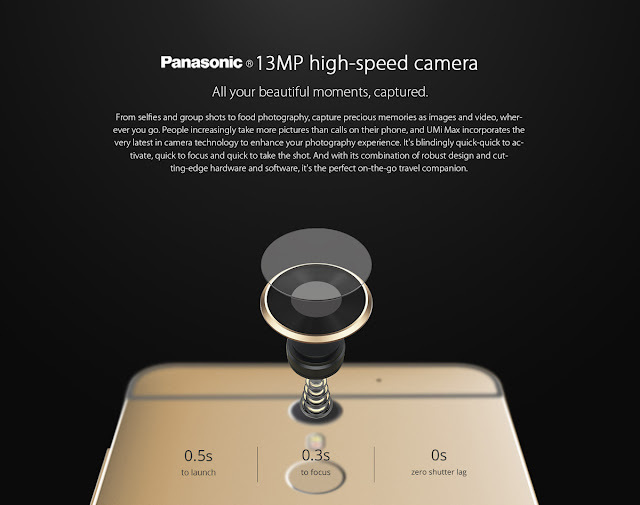 Like the CPU made by Mediatek, using a screen by SHARP, RAM by Samsung, camera by Panasonic. 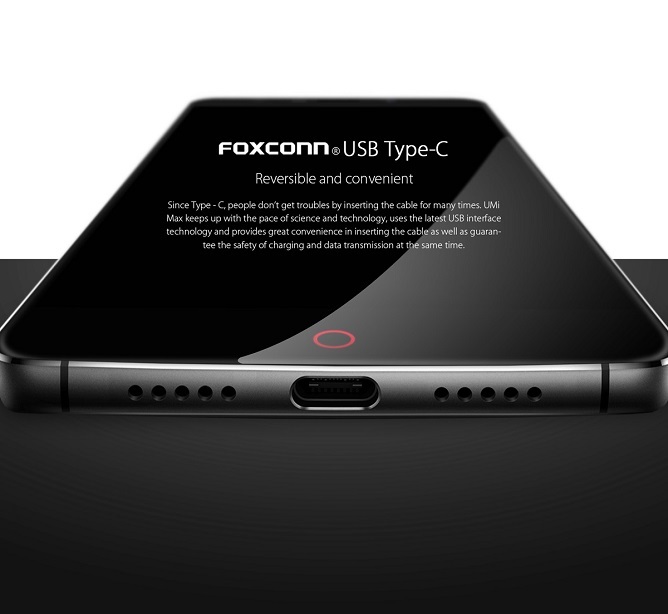 Battery from SONY, USB Type C from Foxconn. All in the mix and produce a product of very high quality. 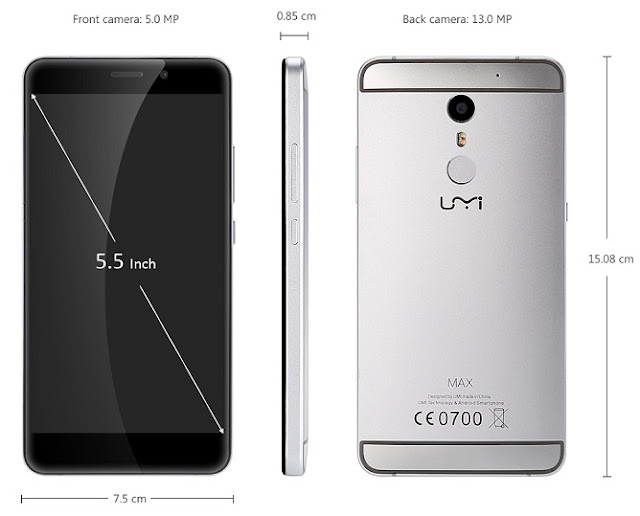 Then, how much the price of UMI Max 4G Phablet? Currently it price only 139.99 USD . As quoted from the site's online shopping GearBest. This price was cut in discount 50% off in Pre Order Sell. So, wait for what again? Immediately have this phone. 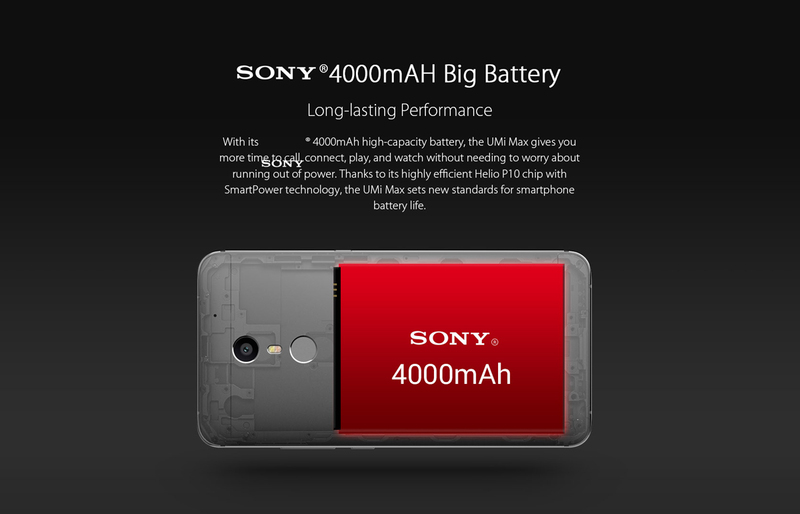 As quoted by Umi official site at umidigi.com, UMi is a global electronics and technology service provider that delivers the latest and most exquisite mobile electronic devices in over 20 countries, including Europe, Southeast Asia, South Asia, the Middle East and Africa. UMi is dedicated to delivering customers with the most extraordinary mobile experience through meticulous designs and smart technology. The marketing strategy of the company is indeed very good, there is no massive promotion, so that can make the price becomes cheaper. This manufacturer only sells officially through online only. 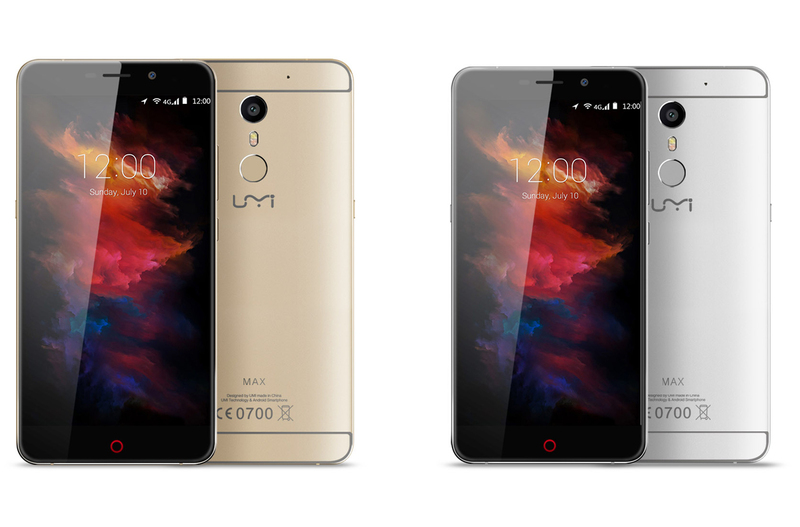 One retailer that sells officially UMI Max 4G is the GearBest. So we can get a smartphone with high-end specifications with a very affordable price. UMI Max 4G was provide two option colour i.e golden and silver. It uses a premium metal on the body. So this smartphone premium in all sections visible beyond. So elegant and luxurious impressed. its processed with high technology so it comfort in every touch. At the bottom of its screen embedded menu button decorated with LED Notification light color with a wide selection. The body size are height 15 cm, width, 7.5 cm, 5.5 Inch diagonal screen and thick 0.85 cm. it can still fit comfortably kept in the pocket of your pants for working outside the room. The bottom of this smartphone embedded USB Type C from Foxconn. 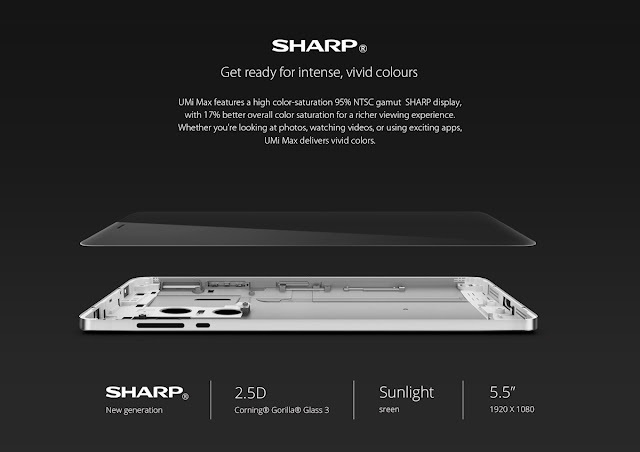 The current technology of vivid color from SHARP pinned on this smartphone. Supports resolution of 1920 x 1080 Pixel Full HD. makes mobile is very comfortable to use in a variety of activities ranging from playing games, to support the work activities. In addition the screen smartphone has been coated by corning Gorilla glass 3 so that we don't have to worry about leaving a trail of scrapes so we're pretty active activities. Speaking about performance, UMI Max 4G Phablet, carrying the Mediatek Chipset Helio P10 with Octacore processor, The Cortex A53CPU and the ARM Mali T860 complemetnt each other perfectly to reach high Antutu score. Its also provide a capacity of 3 GB RAM manufactured by SAMSUNG, so that it can easily to handled any situation of and perfom faster. 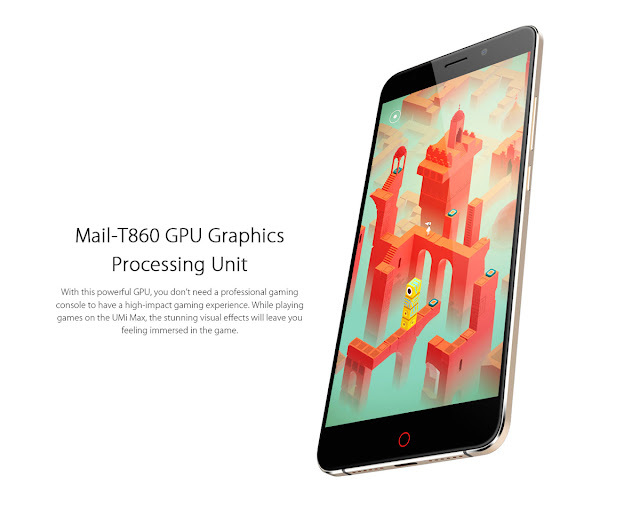 With the support of the Mail-T860GPU. it could run heavy game, which requires a high specification. To capture the important moments or take pictures selfie. There are cameras manufactured by Panasonic. Can also be used for food photography. The output loudspeaker of this smartphone is brings HI Fi+ technology. it can make clearer vocal when the song is played. Accommodate the needs of high-speed internet access. at this time, the UMI 4G Phablet comes with 4G LTE connection support. 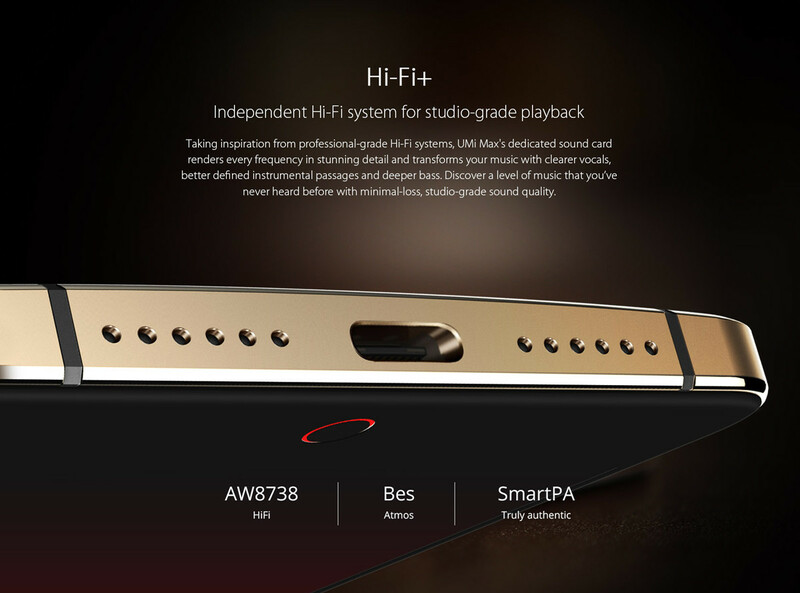 In addition there is also a WiFi 802.11 b/g/n, Bluetooth, GPS. For the Internet, smartphone provides a default browser and Chrome. For connection to a PC, in the sales package has included a separate data cable with charger cable. For you who need the course navigation, Google Maps application available that when testing went smoothly including the application navigation and feature enhancements. With all the advanced features, and meet all the activities. 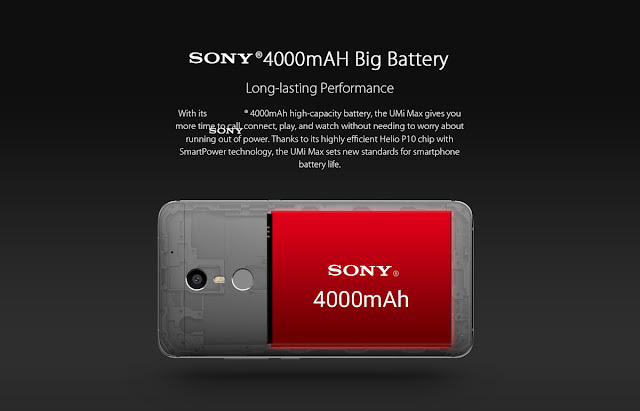 UMi Max is handled with a Battery 4000 mah that manufactured by SONY. 4Th Generation Microarray 3D Fingerprint sensor. 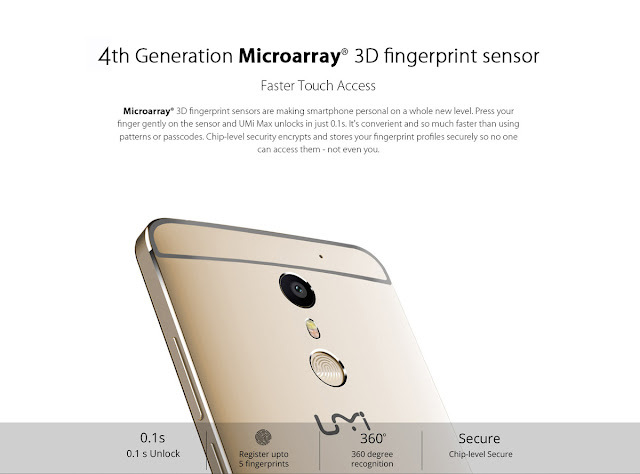 This Smartphone also has been equipped with a fingerprint scanner. 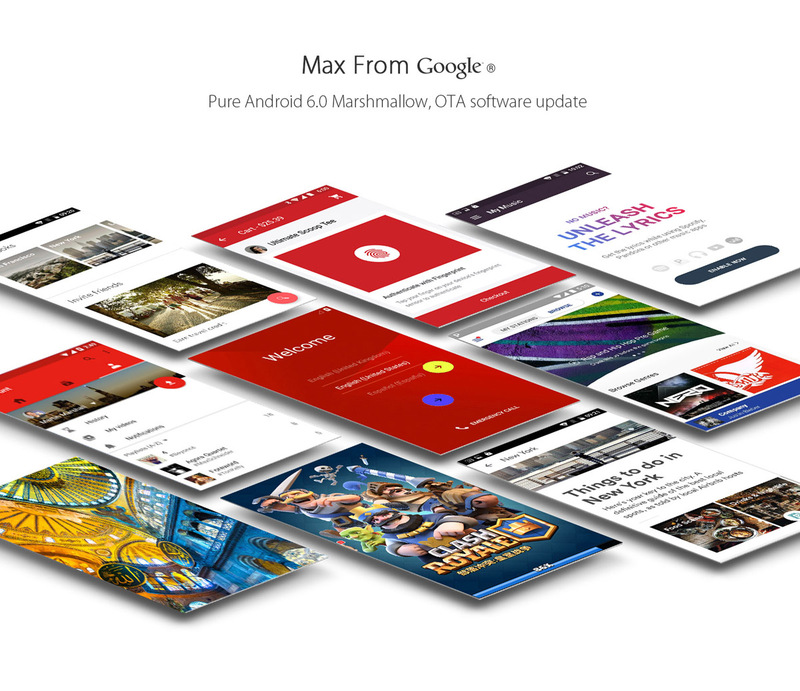 An additional feature is not yet widely used on other smartphones. Umi Max is preorder now . Currently it price only 139.99 USD at Gearbest. Gearbest is officail retailer of UMi with worldwide free shipping to any country in the world. Order Now from Here. - OS ROM is Pure Android. its does not have innovation.